Four wind turbines erected as part of the First Wind project in Township 16, Hancock County, seen here in September 2012. AUGUSTA, Maine — The Board of Environmental Protection on Thursday rejected two challenges to permits granted earlier this year for the $110 million Hancock Wind project in Hancock County. Following a three-hour meeting Thursday in Augusta, the citizen-led board dispensed with appeals filed by Darren Lord and Oscar Weigang. Barring a challenge in the courts, the decision clears the way for construction of the 18-turbine wind farm in the unorganized Hancock County territories of T16 MD and T22 MD. The Department of Environmental Protection approved the project in July of this year, which prompted Lord and Weigang to file their appeals within weeks. Lord argued that First Wind, the parent company overseeing the developments, opted for incremental build-out of wind farms in the area in an effort to gain a more permissive review of the applications because they were smaller in scope. First Wind already has completed the Bull Hill wind farm, has gained approval for the Hancock Wind facility nearby and could potentially apply for another extension of the overall wind farm, called Weaver Wind. First Wind officials argued that their reason for the slow roll-out had to do with financing concerns, not trying to gain favorable reviews. Lord also contended that First Wind doesn’t have adequate financial capacity to build and operate the projects and hasn’t set aside enough money for cleanup should the projects fail, as is required in the Maine Wind Energy Act. First Wind denied those allegations and Department of Environmental Protection officials said the company has met all necessary financial thresholds. Juliet Browne, an attorney for First Wind, also bristled at Lord’s charges. “It’s quite frankly offensive,” said Browne. Weigang’s appeal centered on financial benefits that he said are owed to the farms’ host communities, specifically Hancock County because the projects are located in the unorganized territory. 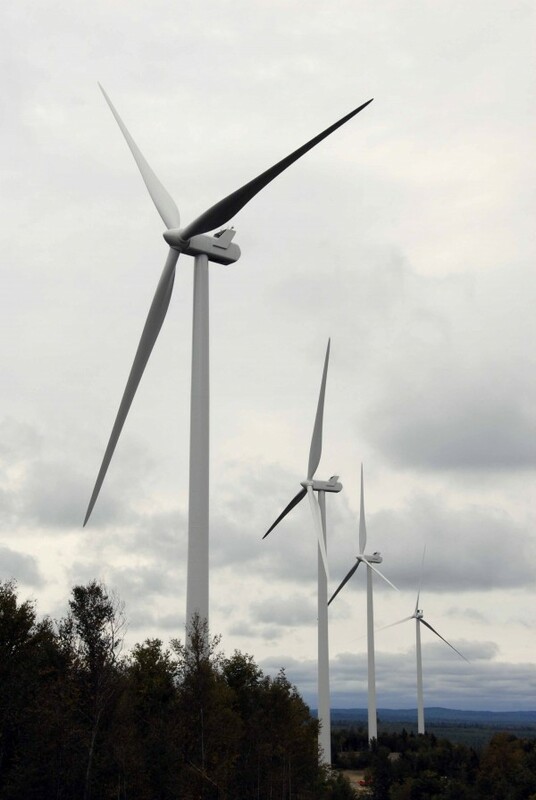 The Wind Energy Act requires wind farm developers to provide tangible financial benefits to host communities, sometimes in the form of $4,000 per-year, per-turbine payments, as well as to the state of Maine. Weigang argued that the Hancock Wind project falls short because it doesn’t compensate Hancock County. However, as the board ruled, the law does not require that every host committee receive financial benefits. Board member James Parker said it is unfair for a state agency or the board to make a decision about finances for elected officials such as the Hancock County Board of Commissioners. “I don’t believe anyone in this room has the ability to act on the behalf of the county commissioners,” said Parker. Other environmental board members said that though the provision might not be fair, it’s in the law that the board must uphold. The board will begin drafting its annual letter at its Dec. 19 meeting. The final vote was 6-1, with Parker voting alone in favor of the appeals.